Kyle Grillot - kgrillot@shawmedia.com After Beach CITE Studios in Alabama donated nearly all of the equipment and furniture Roger Reupert was able to begin having live music at the Listening Room of Dole Mansion in Crystal Lake. 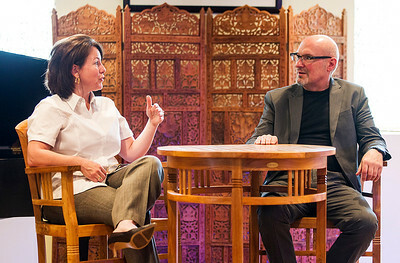 Executive director Siobhan Cottone and program house manager Roger Reupert sit inside the Listening Room Friday, May 16, 2014. The venue has performances every weekend, and the acts range from Blues, Jazz, Folk, Classical, Comedy, and children's theater. The Listening Room has been named the Best Place to Listen to Live Music. 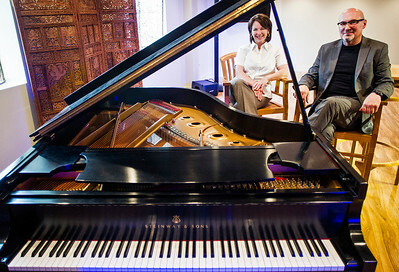 After Beach CITE Studios in Alabama donated nearly all of the equipment and furniture Roger Reupert was able to begin having live music at the Listening Room of Dole Mansion in Crystal Lake. 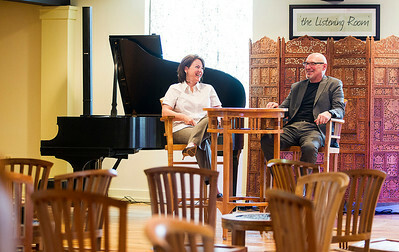 Executive director Siobhan Cottone and program house manager Roger Reupert sit inside the Listening Room Friday, May 16, 2014. The venue has performances every weekend, and the acts range from Blues, Jazz, Folk, Classical, Comedy, and children's theater. The Listening Room has been named the Best Place to Listen to Live Music.